This webinar will feature undergraduate opportunities at the seven Universities of Applied Sciences (UAS7). UAS7 is a strategic alliance of leading German universities of applied sciences as well as the member universities. The presentation will focus on English-taught Bachelor programs in various subject areas, but will also highlight summer programs. This webinar will explain how graduate studies (Master and Doctoral Studies) are structured in Germany and introduce graduate opportunities in various subject areas at Freie Universität Berlin and LMU Munich. Participants will be offered helpful information on the requirements and the application process as well as on resources to assist them in preparing to study for a graduate degree in Berlin or Munich. This upcoming webinar will feature the Technical University Munich and UA Ruhr highlighting their international graduate programs in the STEM fields. After brief 10-minute presentations by the university representatives, participants will have the opportunity to engage directly with the speakers. In this 30 minute webinar, find out more about Bucerius Law School, Germany’s first private law school. The top-ranked school has an interdisciplinary focus and connects students from around the world in Hamburg, Germany’s second largest city with a wealth of cultural activities. The DAAD Young Ambassadors Workshop 2017 took place in New York City from August 16 – 19, 2017. Twenty-three students from all over the U.S. as well as six students from Canada participated in the three-day training sessions in New York City. In this webinar, learn about DAAD funding available to undergraduates and graduates to study, intern and research in Germany in 2018/19. Meet us in New York! Together with the Goethe Institut in New York, we are once again organizing a Career Booster Day for high school and college students. Representatives of DAAD, German business, universities and foundations will inform about study and career opportunities with German and in Germany. 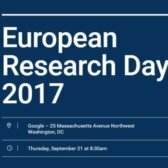 The European Research Day (ERD) in Washington, D.C. is an event where European researchers outside of Europe meet, discuss and exchange concepts about their research projects, professional and personal experience in their respective diasporas and overall career path. DAAD's Information Center in San Francisco, the Goethe-Institut San Francisco, and partners in the Bay Area will showcase excellent opportunities for German speakers in Germany as well as in the U.S.
Join our webinar series from June 12-16 with experts from German research institutions and testimonials from all over the world giving you insight into the German research landscape, funding opportunities and much more…The event is open to anyone interested in doing research in Germany. It is free of charge and will be conducted in English.